When you start to see eggnog everywhere, you know the holidays are here! This velvety, smooth and rich drink… warm with spices, is a festive drink for sure! (Photo from Kathy Casey’s Liquid Kitchen®). 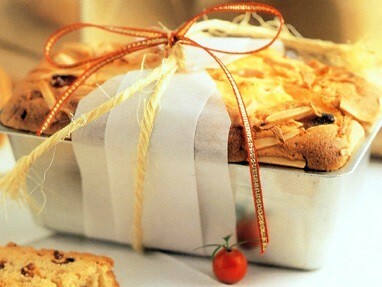 And variations abound from traditional to pumpkin and low-fat. Serve it cold, “straight up”, over ice, or with a splash of spirit…like rum, whisky or brandy. That will always adds some holiday cheer to any gathering! But there are lots of other ways to enjoy eggnog other than drinking it. How about a light and fluffy Eggnog Chiffon Pie – a festive sweet ending to a holiday feast. If bread pudding sounds more your style, then try Eggnog Bread Pudding with Rum Caramel. This dish is great made the day before. Just reheat and serve with a spirited rum caramel sauce. Super easy and delicious! And of course, I just can’t blog about eggnog without giving you a good sippin’ recipe! 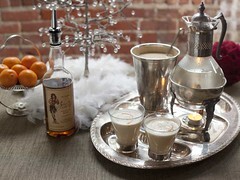 My Hot Buttered Eggnog is a great winter warmer and a combo of two beloved sipping favorites. The base is made with rich vanilla ice cream and easily freezes so you can have it on hand for unexpected guests! Watch how to make it on my Liquid Kitchen cocktail show and for more great holiday cocktail ideas, check out www.liquidkitchen.com. Combining two holiday favorites! Add more or less to taste; rum and Spiced Eggnog Mix. For a demo on how to make this drink, check out my cocktail video on Liquid Kitchen. Place Buttered Eggnog Mix and rum in coffee glass or mug. Stir in boiling water until batter is dissolved. Grate fresh nutmeg over the top. Garnish with orange zest. I’m in Love with Flash Blending! That’s right, blending. Now, I am not talking about loads of ice and slushy sweet concoctions. I’m talking about the way they do it in Peru for Pisco Sours… heavy on the spirit, fresh citrus, a dash of simple syrup, egg white and a touch of ice. Then flash blended until thoroughly frothy. 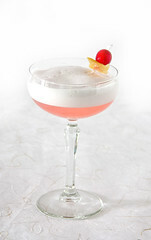 Flash blending was the inspiration for my Snow Drift cocktail – a beautiful (and delicious) example made with botanical Martin Miller’s Gin, fresh lemon juice and housemade Cranberry Ginger Syrup… and of course egg white. To continue reading and for the Snow Drift cocktail recipe, check out www.LiquidKitchen.com. When I think of comfort foods, one of the first things that come to mind is mac & cheese. 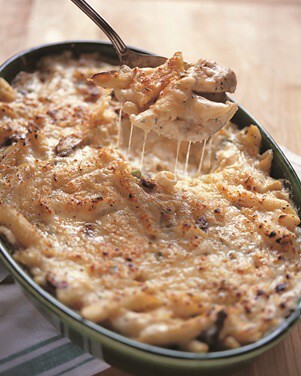 Gooey, warm, and of course, cheesy – this d’lish dish is always a winner! Mac & Cheese is perfect to customize, you can add your favorite ingredients like bacon for a cheddar bacon mac. Or try adding in things like chopped roasted red peppers, green onions, artichokes, smoked chicken, sautéed mushrooms, sausage, green chilies….. the list is endless! Or how about changing up the sauce by mixing in some salsa or chipotle for a kick of heat? Nothing is off limits! We’re opening the doors to my Food Studios once again for all your holiday foodie gift needs. We’ll have all sorts of things to nibble and sip on from tasty bites from my latest book D’Lish Deviled Eggs to samples of hot buttered rum and other delectable items.